Lindsey Bergman is not an average ten year old girl. She is funny, warm hearted and just can’t stop wanting to help! She never stops trying to turn her teachers into lovebirds, and she wants her school bully free. 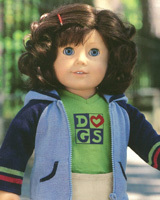 American Girl introduced Lindsey in 2001. She was the first Girl of the Year doll. I got this picture from American Girl Collecting, it’s great! September 22, 2007. American Girl of the Year, History of the dolls, Retired items. The picture is great ! My daugther, Anne-Laure, who is 11, loves Lindsey. But it’s a released doll. Do you know how we could find Lindsey ? Anne-Laure have a great collection (7) of American Girl dolls. We are french and are living near paris. For holiday time, we go often to New York, and of course, we visit American Girl Place. August 19, 2008 at 11:59 am. Permalink. i have a collection of girl of the year dolls for american girl. the only problem is that i dont have Kailey or Nicki and was wondering where i could get for a low price.Thank you so much! January 23, 2009 at 1:39 am. Permalink. You can find girl of today dolls on eBay. February 10, 2011 at 9:37 pm. Permalink.